During the Greek rule in Sicily, almost all of the stone needed for the construction of Syracuse came from limestone quarries – one of them being the Latomie dei Cappuccini. To get the most durable rock, the miners had to dig deeper while keeping the upper part of the rock untouched- carving out an underground cave system. 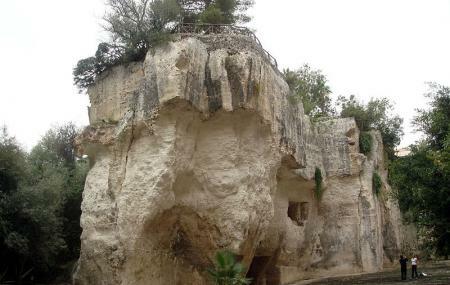 Over time many of these caves have collapsed but the Latomie dei Cappuccini located on the eastern edge of the city, is one of the few that has remained almost intact and is open to visitors. The place was used as a prisoner in 425 BC where almost 7000 prisoners died. Today, in spite of its tragic stories, the place offers quiet a romantic place to take a walk around owing to its flora that spread across the historic setting. The stone pillars, remains of wells from where the capuchin monks would get their water supply and walls that indicate the technology used for cutting the stones- all make for an amiable place to keep your curious mind engaged. The theatre of Latomia is a highlight in itself and was an entertainment space where classical plays would be performed. Carry bottled drinking water and snacks with yourself if you plan on staying here for a few hours. The park is open daily: 9.00 am to 2 hours before sunset. How popular is Latomia Dei Cappuccini? People normally club together Duomo Di Siracusa and Lido Le Nereidi while planning their visit to Latomia Dei Cappuccini. It is a must. A former quarry, then prison, then wild garden hidden in the middle of city. We were there alone, enjoying the wilderness. Just like a Grand Tour.... Offbeaten track worth to discover. Very calm, peaceful place without too many tourists. Beautiful. Posto meraviglioso, luogo di pace e serenità. Poi accanto si trova un bar dove si possono gustare buonissime granite. Dopo vi consiglio di visitare la stupenda Siracusa, veramente bella.